The free Polish forces landed in Normandy in the late summer of 1944 and took part in the breakout from Normandy. By early September they had taken part in the ‘Great Swan’ across France and entered Belgium. They liberated the city of Ypres, on the old WW1 battlefields, on 6th September 1944 and two days later took part in the liberation of Tielt as British forces advanced towards Holland. 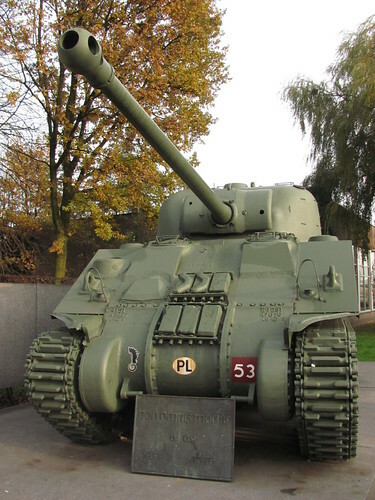 This example of a Sherman Firefly is painted in 1st Polish Armoured Division colours and is an example of the sort of armour that was increasingly being used by British tank units in late 1944. 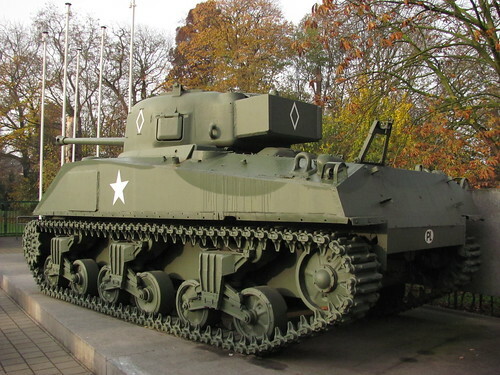 The 17-pounder gave them an edge over German tanks like the Panther and Tiger, but they were still small in number compared to the standard Sherman; in most units there was usually only one in every Troop of four tanks.